We’ve all experienced it. A bad thunderstorm occurs and the lights flicker repeatedly. Sometimes, the power goes out, often preceded by a big energy surge that makes our lights get really bright for a second or two. Such things are part of living on Earth and using electricity. Mother Nature is quite powerful, and as safe as we sometimes feel in our homes, nature can intervene all the time. On top of that, there’s human error. About a year ago, the lights in our house all flashed really brightly, then everything went out. It turns out that there was a minor accident during the replacement of an electric pole not too far from our house. There are also problems internal to one’s house. A fuse blows. A minor (or major) wiring issue occurs. These things can cause the electricity in your home to surge or go out. Each of these rather common events can have a devastating impact on the plugged-in electronic devices in your home. Your television. Your computer (and monitor). Your DVD player. Even things like your microwave. Sometimes, a surge won’t affect them at all. Sometimes, a surge can damage the circuitry inside the equipment, leaving it completely unusable. Sometimes, it just causes a minor problem, causing your device to work most of the time but have weird errors that you can’t figure out. In those cases, you’re going to wind up replacing a device. I’ve seen people replacing televisions, DVDs, computers, computer monitors, and even electronic keyboards due to power surges – and that doesn’t include other effects that resulted in less-than-optimal use of the equipment (like a TV that randomly shuts off every hour or so). The solution to this is simple: get some surge protectors for your electronic devices. 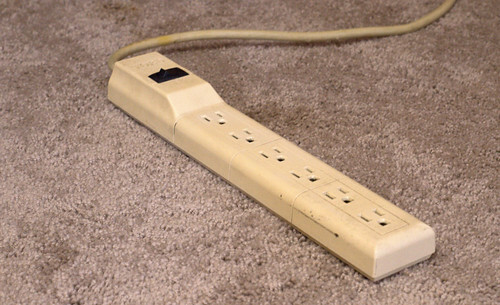 One common mistake is when people think that an ordinary power strip is actually a surge protector. It’s not. A power strip just allows you to use one outlet for several devices and offers no protection. A surge protector usually offers the same benefit as a power strip, but also protects your devices against unexpected power surges, and it usually only costs a few dollars more. If you have an electronic device of significant value plugged straight into an outlet or an unprotected power strip, get a surge protector now and move your device(s) to that surge protector. It’s a simple, one-time action that can keep your device from becoming damaged during an electrical storm. My solution is to never buy an ordinary power strip. There are surge protectors out there that basically function the same as power strips, but offer protection for your devices. It’s worth the extra few dollars for such protection, especially when compared to a damaged computer or television.